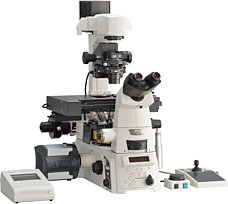 The Nikon Ti-LAPP system provides modular illuminators for total internal reflection fluorescence (TIRF), photoactivation/conversion, photobleaching and epi-fluorescence. Each module can be flexibly combined to build microscope systems that are optimized for individual research needs. 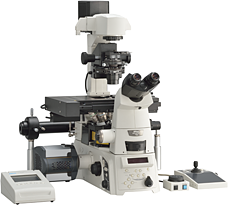 For example, multiple TIRF modules can be incorporated into a single microscope for anisotropy experiments and fast, multi-angle TIRF imaging. 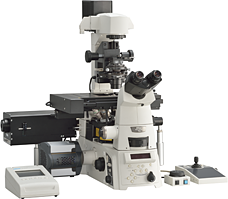 Combined with the Ti’s stratum structure, up to five illumination modules can be incorporated into a single microscope (e.g. two TIRFs, a FRAP, a DMD and an Epi-FL module can all be integrated into one Ti). The new DMD module enables photoactivation and photoconversion of a user-specified pattern and position(s), whereas the conventional FRAP unit only enables photoactivation of a single, manually-positioned spot. The DMD illumination shape, size, position and number can be freely customized using the NIS-Elements software. This capability allows researchers to optically mark a subset of cells or protein populations within a single cell or multiple cells to track their behavior. 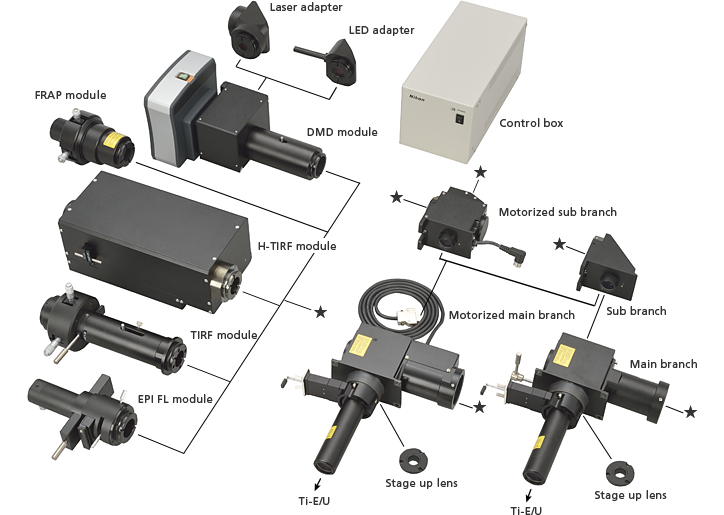 The DMD module is also optimally suited for optogenetics experiments in which highly customized ROIs can be used to optically induce functional changes in subsets of cells or protein populations. The DMD module can be used with either laser illumination or less phototoxic LED illumination. The ideal incident angle and focus of the laser for TIRF observation vary depending on specimen and observation conditions. Adjusting the incident angle and focus for achieving TIRF requires skill and experience. The new H-TIRF module automatically adjusts the focus and incident angle of the laser for TIRF observation by monitoring the reflection beam. This automatic laser focus adjustment and incident angle adjustment is carried out by the auto-alignment function in NIS-Elements software. Incident angles and penetration depths of the evanescent fields can be saved and reproduced for subsequent experiments to ensure consistent imaging results. The H-TIRF module is configured with a gradation neutral density (ND) filter that can be moved into the light path to achieve an even field of TIRF illumination. An in vitro preparation of fluorescently-labeled microtubules (tetramethylrhodamine and Alexa 647) and tubulin binding proteins (Alexa 488) was imaged in three different wavelengths using the H-TIRF illuminator and the gradation ND filter. Incident angles can be automatically adjusted for multiple wavelengths. The video of this image is in the “Sample Images” page. Without the gradation ND filter, TIRF illumination displays a Gaussian profile in the FOV with the center being brightest. 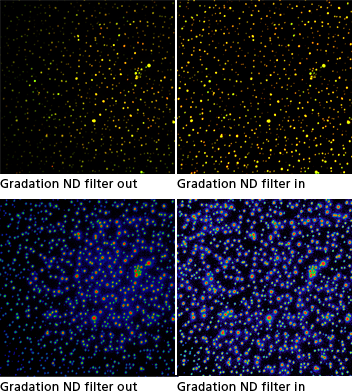 Using the gradation ND filter, a very even TIRF illumination is achieved. 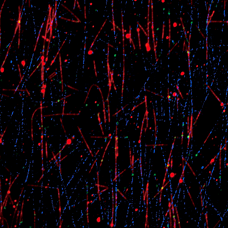 An in vitro preparation of a bi-lipid membrane containing Alexa 488 (green)- and Alexa 561 (red)-tagged membrane-associated proteins was imaged using the H-TIRF illuminator and two different wavelengths (dual color TIRF). The proteins aggregate to form clusters that are visualized as circular structures (the top row). The lower row shows the 488 channels displayed using a rainbow look-up table where different intensities are represented as different colors. The H-TIRF illuminator can be used to automatically achieve optimal incident angles for the different wavelengths. A mouse embryonic fibroblast expressing mCherry-lamin A was spot-photobleached in the upper right corner of the nucleus using the FRAP module to study the dynamics of lamin A molecules. Time-lapse images were acquired using the epi-fluorescence illuminator. Taking advantage of the Nikon Ti’s stratum structure, modules can be incorporated as two separate layers with multiple modules per layer. Using a dual layer configuration enables optimal filter configuration for each illumination module. For example, by placing the H-TIRF module in the lower layer and a DMD module in the upper layer, separate filter cubes specific for TIRF imaging and photoactivation can be simultaneously used in their respective filter turrets also residing in the lower and upper layers. This configuration enables optimal filter selection and improves experimental accuracy whilst maintaining the highest acquisition speeds. A Drosophila S2 cell expressing EOS-tubulin. The end of a single microtubule was photoconverted using the DMD module and 405 nm LED light. Time-lapse images in dual color TIRF were acquired using the H-TIRF illuminator. The addition of unconverted, green tubulin to the growing end of the photoconverted red microtubule, and shortening (and eventual disappearance) of the photoconverted segment demonstrate the dynamic instability property of microtubules. Arrowheads mark the growing and shrinking end of the photoconverted microtubule.